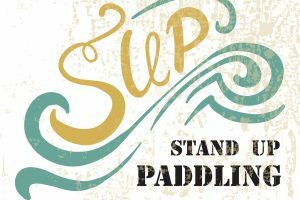 If you have been caught with the paddling bug, then you may be wondering how it’s possible to stand on an unstable board in water. 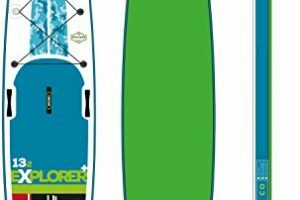 Read on for our How to Paddle Board advice column! 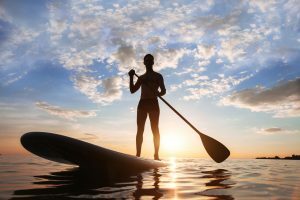 Learning how to paddle board will give you the gift of paradise and tranquility. you to have your most fun in the water. What’s more, when paddle boarding, you are giving your body a full workout as you enjoy a magnificent view from the water. 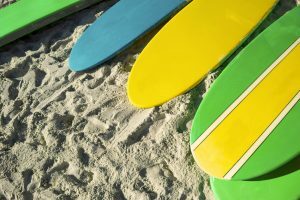 The first thing you need to know before you begin your adventure is to stand on the stand up paddle board, or SUP for short. Make sure you are in calm water where there are no boats or other buoys. 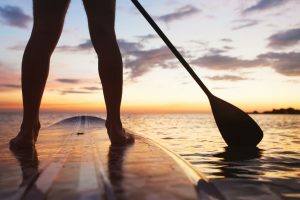 At first, it may be easier to kneel instead of standing on the board when you paddle. 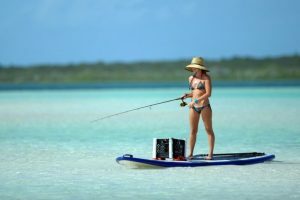 Place the SUP in shallow water about knee-deep with the fin in the water. Place the paddle across the board with its grip side on the side you are and place the blade in the water on the other side of the board. Hold both sides of the board on the edges. One hand, which is close to the paddle grip, should hold both the paddle and the board while the other hand holds the other edge. This is in order to have balance when mounting. Climb the board into a kneeling position. 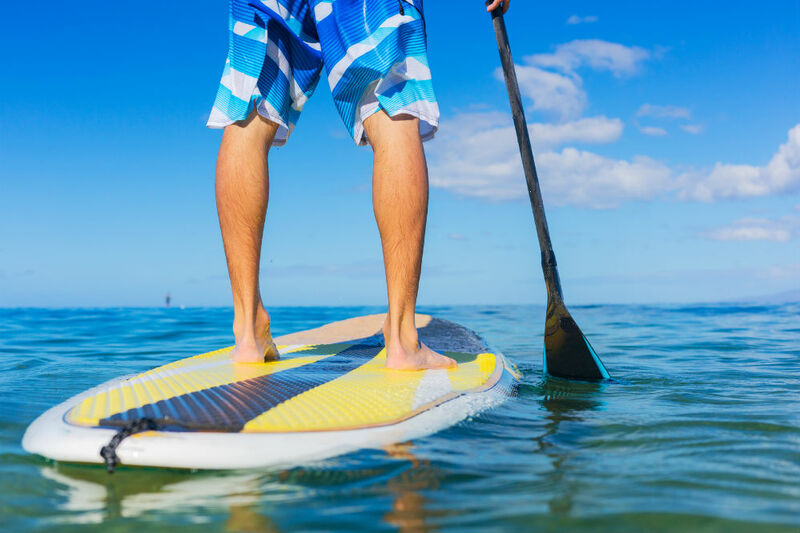 You should start by raising one knee from the water and pulling the board towards your body so that you can place the knee on the board’s midpoint. Move your weight such that your body is above the board and then lift the other knee to the board. Now you should be kneeling on the board’s midpoint. While still kneeling, check the balance of the SUP. It should lie flat on the water. Neither the tail nor the nose should be out of the water. In case either is, you should adjust the position until the board lies flat. As you kneel, you can take a few strokes to gain your balance, especially if you are new to this. 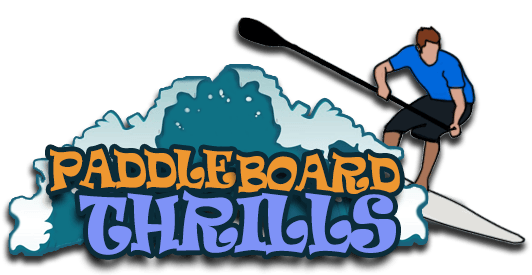 If you opt to stand up, place the paddle across the board and use both hands to grip the board edges. Remember, the hand near the paddle grip holds both the edge and the paddle. As you grip the board for stability, stand up one foot at a time, placing the feet where you were kneeling. Take position. Adjust your feet until you are balanced. You should place the feet hip-width apart between the edges. Keep your knees bent slightly, back straight and toes pointing forward. Use your hips to balance and not your torso. Your shoulders and head should be upright and you should use your hips to shift weight. Keep your gaze on the horizon not at your feet. Now that you are standing, how do you paddle? To grip the paddle, one hand should hold the paddle grip on top and the other should be in the middle. You should bend the elbows at 90 degrees while holding the paddle in front. The angled blade of the paddle should be facing away. Prepare your journey by selecting the right equiptment. You should hold the paddle with one hand on the paddle grip and the other hand on the shaft. Do not be tempted to hold the shaft with both hands. Your feet should be parallel, hip-width apart and toes pointing to the nose when paddling. 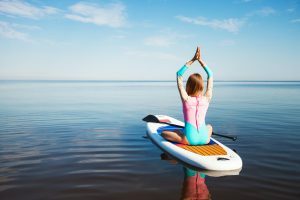 Other positions such as a surf stance can make it difficult to paddle in calm water and you may end up falling. For better and powerful strokes, you should have a long grip on the paddle of about shoulder width apart. While taking strokes, leave the work to the back muscles instead of the arms. If you are a beginner, start paddle boarding in calm waters. Use a wetsuit when paddling in cold water. There is a high chance you will lose your balance and fall as you learn. If you fall, try to aim for the sides so you can fall in water, rather than falling on the board where you may be injured. If you lose the board and paddle in the process, get the board first and the paddle afterwards. You should also let go of the paddle if you fall instead of holding on to it. It won’t sink so you can find it later.